Smile and Wave: I Heart Etsy! I've been wanting to buy Ruby a simple, wooden doll house since before she was born but felt like I should wait until at least her first birthday. 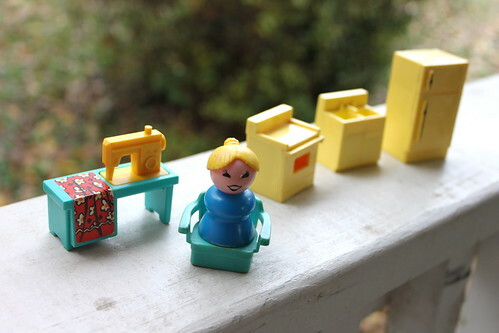 I was doing some research (avoiding the laundry) on Etsy and came across these adorable vintage Fisher Price sets from Toys of the Past. 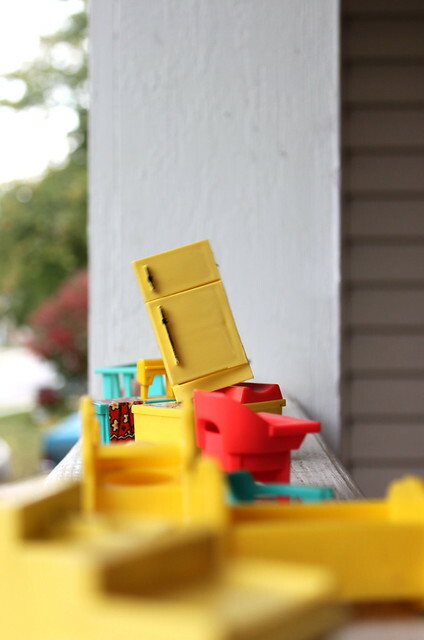 I have vague memories of playing with these original Little People at our church nursery or maybe a friend's house and love the color scheme of the furniture! I had them sitting outside after opening them and Sebastian came out and took an interest in them right away. He was telling the baby that she was in trouble for making a mess. Supposedly the baby had knocked over ALL of the furniture. It seems I need to be a little more patient with my mess maker. This is the nursery set. And these are the kitchen and sewing sets. The sewing desk is what sold me in the first place. It was such a major part of women's lives when these toys were first introduced and I'm glad Ruby will get to enjoy making up stories about what to sew in her doll house. I'll probably add pieces over the next two years, although, I've never run into these in all my years of thrifting. 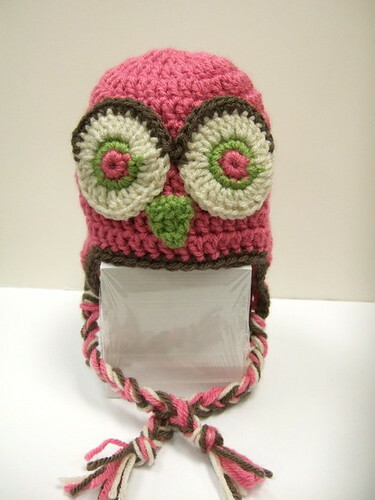 She's also getting this adorable, handmade owl hat from Bzzyfingers. You can customize your colors so I chose the purple base with a light blue border and I will show you as soon as I can wrestle it on Ruby's head long enough to get a photo. That girl is quick! I'm hoping she'll start getting used to it so that her bald little head won't get frost bite this winter! 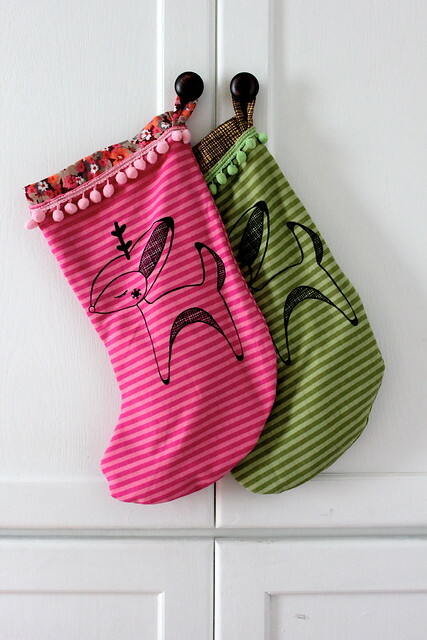 I saw that pink screen-printed stocking from Gingiber Snap on Twitter and went straight to her shop to make it my own. Ruby never got a proper stocking last year so this will be hers. I was hoping Stacie would be offering a boy version and she soon added a green one so I snatched that one up for Sebastian. The colors match our holiday decor and the playful, vintage theme is just the right style for my kids. I'm so thankful to have that part of our holiday checked off the list because last year's good intentions to make family stockings out of recycled wool suits was a bust. What have been some of your favorite Etsy purchases (or on the wish list)? oh my gosh, thank you for introducing me to that sewing set! we had these toys when we were little but i've never seen that one! there's a little thrift shop less than a mile from my house and i pop in there a couple of times a week because they're the only ones around here with toys. i've found 3 vintage little people playsets there so far... i snagged the barn with 22 animals and people for $10, the airplane with 4 people for $4, and the sesame street clubhouse with accessories for $3 !!! they're the only ones i've ever come across. i'm saving them for one day as emma puts everything in her mouth still and i don't want her chewing them all, but i absolutely want to add the sewing set to the collection. :) ruby is a lucky little lady! I so remember having those as a kid! How could you forget those round, smooth heads? I played with the Little People when I was little and LOVED the, as Ruby will. I often browse Etsy in search of childhood toys. Great find. Wow, I can remember playing with that exact "little people" lady with the blue dress and yellow hair. Brings back TONS of memories! Great find! I too had some of those little people, so cute! I wish I still had them all. That hoodie is just too cute! Etsy has been my shopping haven of late - dresses, brooches...and a added a vintage coat to that last night! I went to an estate sale last week that had two full tables of those little people play sets. They're incredible. I wish I would have gotten some. I have those exact same Fisher Price toys in a rubber maid bin in the spare room. They were mine when I was little and my parents kept them for me. My nieces and nephews love them and play with them for hours when they are over. So sweet!! I love that set! My Etsy findings lately have been new tags for the dogs since we moved and now I've been looking for different soakers for cloth diapering (wool and fleece) and other knit baby items. i am so keen to get my hands on some lovely, quirky jewelery from etsy, but i have yet to find the perfect pieces! aaah! that fisher price dollhouse?? we had it too! We ♥ vintage Little People too! My kiddos used to fall asleep with them clutched tightly in their fists! My best Etsy purchases were from Small Earth Vintage and Talk2theTrees. 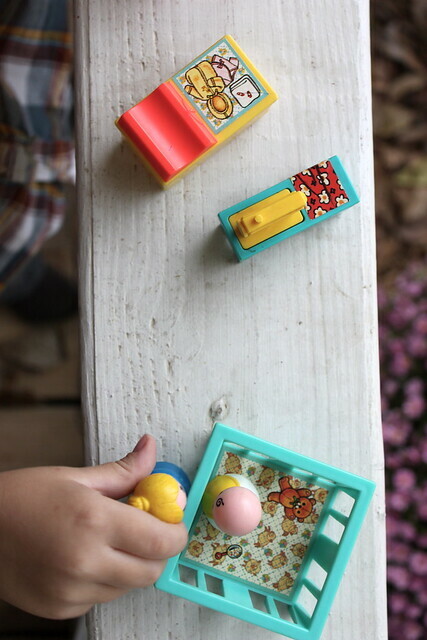 I love vintage Fisher Price! You might want to try browsing and/or keeping an eye on craigslist. Sometimes you can find these sets at garage or estate sales. EEK! I can't tell you how excited I was to see these little people again! I totally played with these when i was a kiddo. I specifically remember several of those pieces!! :) thanks for sharing!! I owned a ton of Little People when I was a kid. They were my favorite toys. We had the house, airport, zoo, barn and so many other wonderful things. My mom is still holding onto them for future grandkids. What a lucky find! 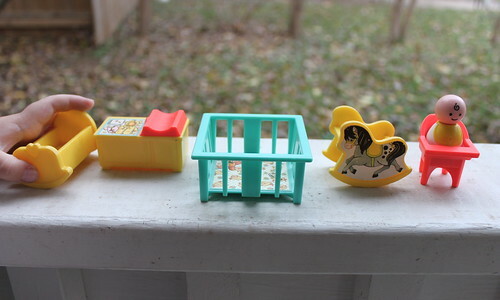 So cute~ my mom still has my little people sets (the exact pieces you bought!) and my little ones love playing with them! Stocking are on my wish list, though I can never narrow it down. The ones you bought are so cute, though, I may have to invest in them. Thanks for the find! I love those Rachel!! We still have ours from many many years ago! Oh wow, I had those toys and loved them! The old style Little People are so fantastic - the modern ones just can't compete. I loved the Fisher Price people and sets. I actually collect them now. Please be super careful with your little girl, the old FP people can be a chocking hazard to the children who still put things in their mouths. A watchful eye and she'll really enjoy them and so will your son. My brother loved playing with them too. I LOVED little people as a kid! I will definitely pass those on to my kids when I have some! Vintage FP toys are always my favorite thing to search on Etsy. I had been watching the toy cameras for weeks but was SUPER excited to find one last week in a junk shop when my mom and I went "picking". My sister and I had the metal 60s dollhouse that was shown on Mad Men last season (when Betty was at the child pyschologist..) and we played with it for hours. Sadly I don't know what happened to it. Great finds! I had those little people when I was a kid, and I loooved them. I would guess that's why you don't find them in thrift stores - too loved? I have been on the search lately too! So tough to find, and pricey when you do. My mother in law has kept all these little people sets from when my husband was a boy, so when we go to their house my boys have so much fun playing with them!! When I mentioned to her how much these sets are selling for she was shocked! I came across 2 little people at a thrift store in Arkansas for 25 cents and recently found a "mom and dad" to go along with the boys--just like our little family ;) LAst week at Relics I grabbed the lift & load depot--$12 is more than I like to spend but they are hard to find!! I *adore* that sewing set!! No way! We had that too!!! I played with those fisher price people as a kid, too! So much fun : ) And that owl had is adorable! 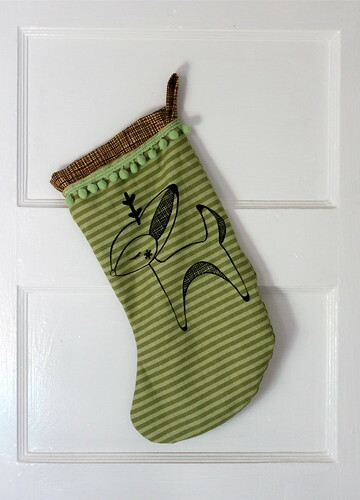 Those stocking are the cutest I've seen in awhile! I have the doll house that goes with those!!! Now I know I definitely need more toys to go inside. I never see the toys at the thrift store but I did buy my house there. You can see it on the top shelf in my son's nursery. Please be careful!! Those adorable Little People were discontinued because they are choking size. I know someone who lost their darling little boy! I appreciate your concern. We always keep a close eye on Ruby because she is the child that puts everything in her mouth and may even just let her enjoy the larger pieces without all the people until she's older or grown out of that. I'm sorry to hear about the family that lost their son. Thank you for sharing. I love Fisher Price! One of my faves from childhood -- I remember that nursury set. We found my husband's FP Western Town and airplane sets...I know my mom still has the farm set. Our little Liam is going to have some cool toys before he even gets here! The dollhouse is a great find! My parents still have the one I played with when I was little. I never had a sewing machine in the set, though. It looks like I'll have to track one down! Etsy simply is the best. I bought handcrafted doll house furniture for my sister a while back. It was crafted out of acorns! That was one of my favourite purchases. I know- with as many great vintage finds that I get at thrift stores, I haven't ever seen these there either. And I always have my eye out. I've seen the Little people dollhouse a few times, but there's always been something wrong with it-broken garage or something. I'm holding out for one in better condition! I loved the fisher price little people!! I even had the house.... it was my favorite toy.. it went everywhere with me! thats so cool to see those toys! my aunt had a daycare when i was a kid and had a huge wooden doll house with all those little guys I remember the rocking horse and playpen specifically! so neat I want some now!! You should also try searching for these vintage FP sets on Craigslist! AllofCraigs.com allows you to search every CL in the country - all you have to do is find a seller who will ship for some extra moola. I was looking for a vintage parking garage and fund a number for under $30! I even found a complete wood Playskool parking garage for $10!! love, all of your picks! your kids have some pretty awesome things from mama (and dadda). i totally remember playing with a doll set so similar to this, a doll house AND the barn with the farmer and farm animals. i loved that the barn mooed every time it was opened. can't wait to see the photo of ruby in her hat! I had that exact nursery set when I was a kid! And the sewing machine too! I love Fisher Price.. I had some of those toys when I was little. Seeing the pictures just reminded me! oh how cute. I LOVE the stockings and the owl hat! (You have great taste!!) 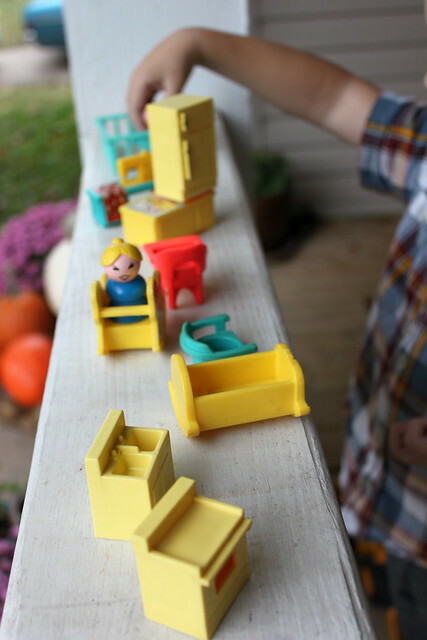 But the Fisher Price furniture is seriously making me giddy! I used to have the nursery set. So many memories come back looking at those little pieces of plastic! My mom still has some of them. I need to scrounge them up before they disappear.